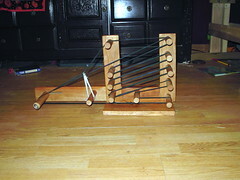 Inkle looms - more pictures! Umm, yeah, so I got camera-happy last night. I had to fix the fence (again) when we got home, so I wasn't really in the mood to be creative. Ah, well - ya'll win, so all's good, yes? 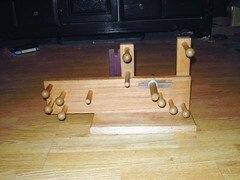 This is my original inkle loom. It is very compact, easy to hold in your lap, and will hold 2.5 yards of warp. I just wish it were bigger. You can't see it, but the builder included a wooden "pocket" on the back of the front upright to hold the shuttle. The tension bar has a nice knob on the other side, and is placed so the weft doesn't get caught in the threaded bolt. 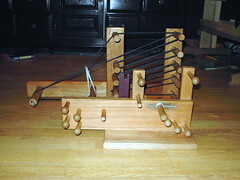 So, I finally broke down and aquired a larger inkle loom. I don't like it as much - it's *too* big, which makes it awkard to hold in my lap, won't stay balanced and flat on the table..and isn't sanded perfectly smooth. I added a strip of leather to the back of the front upright to hold the shuttle when not in use - I'm spoiled! *g*. The tension bar is held by a wing nut (ick...I WILL replace that with a knob soon) and the weft keeps getting wrapped around it, especially after I advance the warp. And, here's a "side-to-side" comparison. You can see how much more compact the original inkle loom is. I need to find someone who will make me a "super-sized" version of my original loom. I don't have the tools (like a drill press...*g*) to make it myself, or I would pick up some paduak or purpleheart planks and dowels and go to town. Yes, I am an exotic wood junkie...mmmmmmmmmmm, paduak.